DENVER: Weight-loss company Atkins Nutritionals has selected MWW Group as its AOR to re-educate consumers about its low-carbohydrate food program. The company approached MWW directly and did not review other agencies, said Scott Parker, CMO of Atkins. He explained that he noticed MWW's work in the health and wellness space while managing RFPs during his seven-year tenure at Jenny Craig. He joined Atkins last January. “What I was looking for was a PR group that had expertise with healthy lifestyle brands, specifically edging toward the dieting category, and MWW has experience with Zumba and prior experience with NutriSytem. Those things were very important,” he said. RF|Binder Partners had served as Atkins' PR AOR for the last three years. It named Kohnstamm PR its AOR in April 2008. An RF|Binder representative declined comment on the matter. MWW will be charged with re-engaging consumers about the Atkins weight-loss plan and debunking myths about it, said Parker. “First of all, we want to make sure that it's very clear to consumers that Atkins is the original, and the leading, pioneering low-carb weight-loss plan, and that we are unique in the scientific research that backs the efficacy of our diet,” he said. Kas Rigas, SVP at MWW, said the agency will focus on telling consumers the Atkins story and explaining any misconstrued elements of the program. She said some people think vegetarians cannot use the plan, but it does have vegetarian recipes and advocates eating more vegetables a day than US Department of Agriculture guidelines. 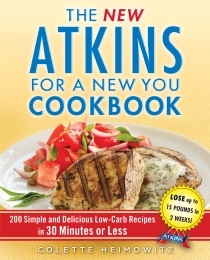 The agency will also promote “The New Atkins for a New You Cookbook” by Colette Heimowitz, which debuted this month, said Rigas. The firm is conducting a satellite media tour to promote the book after helping to launch it at a New York event. Parker added that MWW will also advise the company on its social media channels and blogger outreach. Atkins' digital AOR is The Jar Group, he added.